Join us as we make Washington State the most hearing-friendly place in America. Let’s Loop Seattle is dedicated to universal hearing and communication access. We remove communication barriers and open doors to employment, public accommodations, state and local government services, transportation, and telecommunications. We support hearing loop education and provide information resources for people with hearing loss and public venues. We also advocate for legislation to improve communications access for people with hearing loss. Hearing loops are the international standard for hearing accommodation. Loops meet the communication access requirements of the Americans with Disabilities Act (ADA). Hearing loops are unique in providing a direct audio connection to telecoil-enabled hearing devices with no additional equipment required. More and more churches, theaters, town halls, libraries, classrooms, retirement communities and senior centers, hospitals, and even taxis and ticket windows are getting in the hearing loop the world over. We invite you to explore our website, and connect with us to learn more. April 19, 2019 – The hearing aid consumer education bill (SB 5210) is headed to the governor’s desk! If it’s signed, we’ll be working with the Department of Health on rulemaking and time. We’ll keep you posted. Please join us in advocating for Senate Bill 5210 and its companion bill, House Bill 1078. These cost-neutral bills require any person who engages in fitting or dispensing hearing aids to educate their customers – prior to fitting – of the uses, benefits, and limitations of telecoil and Bluetooth technologies. Download a copy of our flyer (or an accessible version for people with low vision) and consumer testimonials and share with your legislators, audiologist, and anyone who needs the information. For current status on the bill, view our 2019 legislative session page. People with hearing aids must have a telecoil enabled device – and know how to use it – in order to connect to hearing loops and other ADA mandated public Assistive Listening Systems. Without understanding telecoils, people with hearing loss might not choose the best hearing aids for their needs and lifestyle, nor experience the full functionality of their hear­ing aids. And they might not gain full public communication access, despite investing perhaps thousands of dollars in their hearing aids. 1) Find and contact your local legislators using District Finder. Let them know you want their help in adopting this legislation. 3) Share this information with legislators, people with hearing loss, and hearing loss advocates. For more information, sample letters/comments, and bill updates, go to our 2019 Legislative Session page or contact Cheri Perazzoli or Cynthia Stewart. April 3, 2019 – Join our friends at Rooted in Rights and Disability Rights Washington for a film festival and discussion on May 7, 2019, at the Forum at Town Hall Seattle. CART and captioned videos; ASL on request. We hope the new loops at Town Hall will be working, and we’ll update you as soon as we know. April 1, 2019 – New Mexico now has a telecoil education law! The governor signed House Bill 48, which requires telecoil counseling for hearing aid buyers. Way to go, Steve Frazier and our fellow New Mexican advocates. January 1, 2019 – Adults under Washington State Medicaid can now receive a hearing aid (thanks to SB 5179, which restored coverage.) Final rules are being written, but interim rules are in effect. Here’s more info from DSHS. Please share this news far and wide, so that people with hearing loss can get the help they need. November 28, 2018 – Interested in a loop for your home? Here’s a step-by-step guide from Loopin’ Lou Touchette. 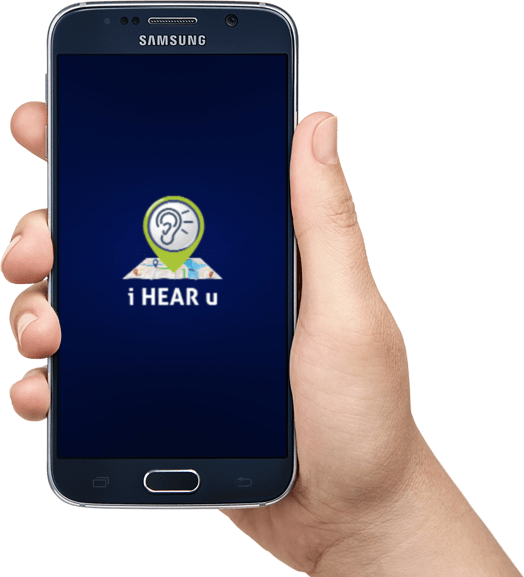 September 10, 2018 – The iHearU app now lets you indicate hearing loops. Are you using the iHearU app? Designed by UW professor and hearing loss advocate Dr. Kelly Tremblay, iHearU allows you to rate the sound level of restaurants, places of worship, hospitals, and more. iHearU needs YOU! The more places that are rated, the more helpful it is for people with hearing loss and their families and friends. Download it from your phone and start using it today. It’s free. August 27, 2018 – IEC Standards Brochure from Contacta. What do we mean when we say that hearing loops need to be installed to IEC Standards, and why does it matter? Click here to read more from Contacta. August 23, 2018 – Buying a hearing aid can be confusing and overwhelming. This brochure from HLAA-WA can help. You know you need to ask for a telecoil, but did you know you have a 30-day waiting period before your sale becomes final? Find out more about your legal rights, types of hearing loss, types of hearing aids, what to ask your audiologist, and more. June 5, 2018 – Need help asking for hearing access? Download our brochure for printing, or email it to the venue. Remember, communication access is required by law. May 21, 2018 – The King County Council proclaimed May 2018 Better Hearing and Speech Month. Thank you, Council members. March 21, 2018 – Senate Bill 5179 passed and was signed by Governor Inslee! Thank you to everyone who wrote to their lawmaker or testified in support over the bill—and of course, huge thanks to Governor Inslee and the Washington State Legislature for taking this step toward helping some of our most vulnerable Washingtonians. Our hearts are full. Hearing aids are now covered for adults on Washington State Medicaid, effective January 1, 2019. Please share this information with anyone who may need it. Governor Inslee signs SB 5179 while Senator Bailey, Walt Bowen, Joanna Grist, Rep. Goodman, Senator Conway, and others look on. December 22, 2017 – Thank you to the Redmond Reporter for their story not only about us, but also about hearing loss advocacy. December 12, 2017 – The Federal Way Performing Arts & Events Center is looped. Thank you to the Federal Way Mirror for this fantastic coverage. September 11, 2017 – The Seattle Times talks hearing loops, and we’re quoted. Thank you, Puget Sound Hearing Aid & Audiology and Seattle Rep for embracing the loop! April 11, 2017 – Senate Bill 5177, which requires long-term care workers be trained to recognize hearing loss, passed the House unanimously! The emotional and social impacts of hearing loss can be tremendous. Many people, feeling the stigma that surrounds hearing loss, hesitate to treat it or ask for accommodation. Yet untreated hearing loss can isolate people from their friends, families, and communities. Hearing loops and other assistive listening devices are life-changing for many, reconnecting them and re-engaging them with hobbies, jobs, and community services. The financial impact of hearing loss not adequately treated or accommodated has been estimated at $122 billion in lost income and $18 billion in unrealized tax revenue. Hearing access creates opportunities, civic engagement, professional success, and cultural appreciation. Universal loop technology can be used almost anywhere worldwide, helping communication in transient situations every day for millions. Let’s Loop Seattle has helped bring loop technology to many Washington venues. For a list of looped locations in Washington, visit our Loops in Washington page, download our brochure, or check out our list of looped locations (updated February 2019). 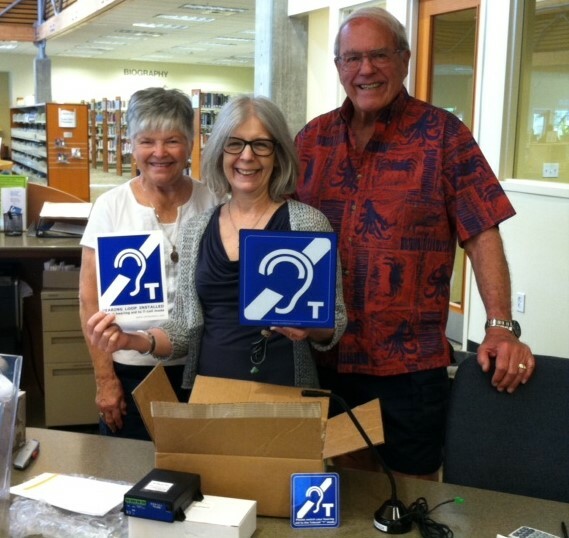 Washington State’s Office for the Deaf and Hard of Hearing (ODHH) has installed loops across the state. Check this list with loops and addresses to access State of Washington government services and assistance via a hearing loop. To find loops nationally, try LoopFinder, also available as an IOS app, or Loop America. If you’d like to join a loop campaign closer to you, download a a list of other local loop campaigns around the country. We welcome you–venues, organizations, disability groups, senior groups, veterans groups, and everyday folks of all hearing abilities–on our journey to universal communication access and hearing-friendly neighborhoods. Commuting and traveling are safer, easier, and more enjoyable when fully accessible to everyone. Airport terminals, trains and train stations, metros, buses, taxis, and all check-in and ticket counters all benefit tremendously from hearing loops. Clear communication is critical in health care settings. All heath care services– emergency room care, inpatient and outpatient services, surgery, clinics, classes, cafeterias, and gift shops–should be hearing accessible to ensure patient safety and confidentiality. Participation in public forums is a right of all citizens. Government agencies that create universal access by readily providing communication aids and services (hearing loops, real time captioning, interpreters) encourage collaborative civic engagement. We must provide all students with an education they deserve and equal opportunities to achieve their goals. Classrooms, auditoriums, and learning centers need to be accessible so that all students can participate and learn. Universal access allows everyone to understand and enjoy performances without standing in line to check out and wear stigmatizing equipment that may or may not work. Arenas, theatres, and venues can easily provide communication access at ticket windows and food and vendor counters via a simple loop. The unemployment rate for people with hearing loss is 20% higher than that of the general population. Most people with hearing loss report lifetime earnings of nearly half a million dollars less than their hearing counterparts. Communication access in the workplace is vital to an inclusive 21st century workforce.